This could've been my ticket to an Academy Award as well as an invitation to the The Entertainment Media Show in London. 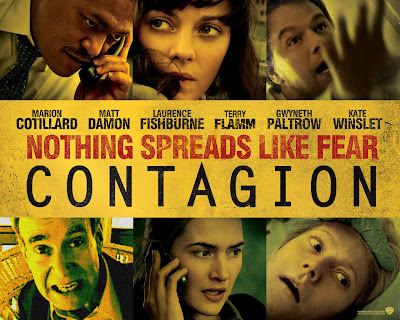 So as it turns out, I’m nowhere to be seen in Contagion despite the fact that my performance as an extra would have generated an Oscar buzz. The two scenes I worked on (a makeshift hospital set up in an armory and an outdoor field where food was being distributed) were filmed in Chicago but are supposed to be taking place in Minneapolis. The graphic above shows how the poster might have looked if my scenes had been given the proper consideration. Spade Kitty Records presents The Gentlemen Of Obscurity tonight at Friendly Tap in Berwyn, Illinois. The band is comprised of Geoff Simons, Tim Gitings, and Matt Walters, with help from Zane Ranney, Joe Goldberg, and Rachel “Roxy” Swain. The musicians have regular gigs in other groups, and are coming together for one-time only although they do have an album available on iTunes. The Welcome and The Hemmingbirds are also on tonight’s bill. The show starts at 9:00 PM and admission is free. Material Re-Issue has a special evening planned for power pop fans tomorrow night at Lincoln Hall on Chicago’s north side. The trio, made up of original members bassist Ted Ansani and drummer Mike Zelenko, along with veteran power pop singer-guitarist Phil Angotti, will be joined by special guests Jay O’Rourke from The Insiders, Jeff Murphy from Shoes, and John Haggerty from Naked Raygun. Those in attendance will also be treated to producer Lou Hinkhouse’s short film about Material Issue in the days when Jim Ellison served as lead vocalist-guitarist. The hard-hitting four woman band Rockit Girl, who recently reunited, will be the opening act. The show starts at 9:00 PM. Dolly Varden, the alt rock-country & western band fronted by the husband and wife team of Steve Dawson and Diane Christiansen, will be performing an hour-long set tomorrow afternoon at 1:30 as part of the Brilliant Corners Of Popular Amusements Festival The eclectic celebration, which kicked off at 5:30 earlier today, is being held at Eckhart Park, at Chicago Avenue and Noble in Chicago. School of Seven Bells plays at 9:00 PM Saturday, and the Steve Albini led trio Shellac shreds the stage on Sunday at 9:00 PM. A number of novelty acts, The Renegade Craft Fair, and a Farmers Market will also be part of the fun. The Guinness Oyster Fest being held today and tomorrow at Damen and Roscoe looks to be one of Chicago’s more ambitious street parties this year. The Human League performs at 8:30 tomorrow night, closing out a day that will also see Dot Dot Dot, Scotland Yard Gospel Choir, and Men Without Hats taking the stage. The Irish-centric Stage offers the Irish Music School of Chicago, The Trinity Irish Dancers, and other Celtic entertainment all day tomorrow. Black Forest Presents A Night Of Neil Young Songs takes place tomorrow night at Cafe Mozart at 600 Davis Street in Evanston. Ten different acts will be involved in the tribute, which starts at 7:00 PM. Snackstock 2011 A Benefit Concert For Ovarian Cancer will be held from noon to 5:00 PM on October 9th at Austin’s Fuel Room in Libertyville, IL. Two live bands, Ordinary Outcast and Goin South, will provide the entertainment. Fans of the Internet show Sunday Morning Coffee With Jeff will surely remember Goin South as the group frequently covered by On The Road reporter Willy Deal. Former Doctor Who star David Tennant will be hosting the Manchester Rocks Concert For Children In Need at the M.E.N. Arena on November 17th. Performers include Coldplay, Snow Patrol, Elbow, Michael Buble, Lady Gaga, and some surprise guests. The concert will be broadcast on BBC One anf BBC HD. Those of us who’ve been longing to someday mingle among a multitude of fascinating stars at the annual San Diego Comic Con now have an even bigger event to put on our wish list. The Entertainment Media Show with Collectormania is being held in London on October 1st and 2nd. The stellar guest list includes Diana Rigg of Emma Peel fame; David Tennant, Arthur Darvill, and several other actors involved with Doctor Who; John Hurt from Harry Potter and countless other films; Eve Myles from Torchwood and Merlin; Jenny Cresswell from Star Wars and Space 1999; Armin Shimerman from Star Trek, Buffy The Vampire Slayer, and Stargate; Jane Wiedlin, the Go-Go’s member who also appeared in Bill And Ted; and several other performers from cult TV shows and movies. There will be photo shoots, merchandise and dealers, comics, anime, and other events. Plus, it’s in ENGLAND! The website proclaims “Visiting the show can give you the opportunity to take part in free talks with the stars” and “Everything to keep the big kid in all us happy!’ If only my scenes hadn’t been cut from Contagion! I would have been invited to this convention.